Video: Morning Joe MSNBC - Ken Adelman on REAGEN AT REYKJAVIK. Video: Reagan's Finest Hour, A Multi-Media Presentation by Ken Adelman. Ken Adelman served as the U.S. Arms Control Director for President Ronald Reagan and accompanied him on three superpower summits with former Soviet leader Mikhail Gorbachev, including the historic and dramatic October 1986 summit in Reykjavik. Now, Adelman is sharing his experiences at that monumental meeting in his new book, Reagan at Reykjavik: The Weekend That Ended the Cold War (Broadside Books). A superb storyteller with an accomplished career, Adelman is an excellent keynote speaker for schools and universities, museums, libraries, historical societies, and corporations. In Reagan at Rejkjavik, Adelman gives a firsthand account of the forty-eight hours that President Ronald Reagan and Mikhail Gorbachev spent in the isolated city dealing with the world’s most critical issues. Originally intended as a short, inconsequential meeting to lay out plans for future summits, the conversations quickly turned to the major issues of the day, from research into the strategic defense initiative, to the possibility of eliminating all nuclear weapons. With both men at the height of their power, they had the rare opportunity to move towards peace, which lead to concessions and negotiations neither side had predicted. While the leaders failed to reach a final agreement that weekend, their discussions and negotiations led directly to the most sweeping nuclear arms accord in history the following year. Scrupulously researched and based on now-declassified notes of Reagan’s secret bargaining with Gorbachev, Adelman tells a gripping tale and provides an honest portrayal of Reagan during one of his finest and most challenging moments as president. Adelman spent more than a dozen years in public service, working as Assistant to the Secretary of Defense in the 1970s and as a U.S. Ambassador to the United Nations and U.S. Arms Control Director in the 1980s. He also served as a member of the Defense Policy Board from 2001 to 2006 and on the Advisory Board of the National Counter-Terrorism Center under President Obama. His awards include the Secretary of Defense Award for Outstanding Public Service and the Arms Control & Disarmament Agency’s Distinguished Honor Award. 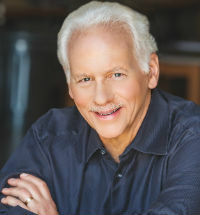 A nationally syndicated columnist for eight years with the Tribune Media Services, Adelman also wrote hundreds of articles in leading journals and newspapers. Before Reagan at Reykjavik, he was the author or co-author of five books, including The Defense Revolution and Shakespeare in Charge. He graduated from Grinnell College majoring in philosophy and religion, has a Masters in Foreign Service Studies, and a Doctorate in political theory, both from Georgetown University. He has taught at Johns Hopkins University, Georgetown University, and George Washington University. With his wife, Carol, Adelman teaches executive leadership through the works of William Shakespeare in their firm, Movers & Shakespeares. He was also the executive director of the Aspen Institute’s “Arts and Ideas” series. The Adelmans, who split their time between Virginia and Aspen, Colorado, have two married daughters, one a corporate executive and the other a concert violinist, and three grandchildren. 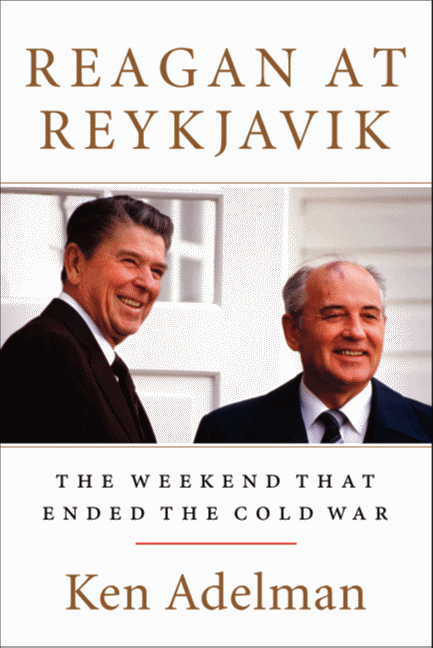 "Reagan at Reykjavik is a lively, important account of an historic weekend. On a barren island nation in the north Atlantic, the two great nuclear adversaries faced reality -- and the world was changed." "A fascinating, gripping and essential account of the definitive end-game moment of the Cold War, told by someone who had a front-row seat." "With wonderful insight and color, Ken Adelman details the great drama of the Cold War's most surprising summit. This book is deeply important in an era when Reagan's art of principled negotiation needs reviving." "It was the beginning of the end of the Cold War, and when you read Ken Adelman's account of the Reykjavik summit, you are there. You see the drama and meet the characters, you hear the arguments and follow the action, as history is made over a memorable October weekend in Iceland." "Ken Adelman has written a genuinely fascinating book -- vivid and personal, humorous, full of surprising new details. The book's portrayals are all memorable, but most so when it comes to Ronald Reagan." "A knowledgeable, passionately engaged fly on the wall at one of the least heralded, most productive summits of the Cold War era."